By Alexis Leon & Mathews Leon, Leon Vikas, 2009. Information Technology (IT) is revolutionizing the way in which we live, work, study, learn, play, and do business. The digital revolution has given mankind the ability to treat information with mathematical precision, to transmit it at very high accuracy and to manipulate it at will. Computers and communications are becoming integral parts of our lives. A few decades back communications used to be between people. But now inanimate objects are getting into the act—books can tell the cash registers how much they cost; identity cards can tell the door lock whether to open or not; automated guided vehicles can tell the host computer where they are in the shop floor, what they are carrying, and when they will be free; missiles can compare the landscape with their own map and hit the target with pin-point precision; on the Internet people engage in lively chats, discussions, and play games even if they are physically in different continents. The changes mentioned above in the fields of Computer Science and IT add up to what is called the information revolution or IT revolution. To survive in this information world one must keep pace with these changes. As with the first edition, the objective of this book remains the same—provide an introduction to IT. The book deals with the fundamental concepts, technologies and theories as well as advanced concepts and practical applications. 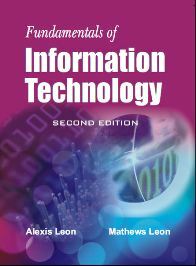 The book starts with an introduction to computers and telecommunications and then deals with the latest developments and technologies. The book is divided into nine units and deals with IT and related topics from the fundamentals to the advanced. The first unit deals with the working of computers, computer peripherals, and the IT basics. Unit II covers the software development process and the different kinds of software that we use in our daily life. Unit III gives an introduction to databases, database architecture, database design, data modeling, and database management systems. The fourth unit gives a comprehensive overview of telecommunications, networks, communications systems, and distributed data processing. Unit V deals with Internet, WWW, intranets, e-mail, e-commerce, web design, web technologies, etc. in great detail. The sixth unit covers a very important area of IT—computer security. Unit VII gives an in-depth coverage of multimedia, multimedia applications, and virtual reality. Unit VIII gives an overview of the emerging technologies in the IT field. The ninth unit gives the practical applications of IT in everyday life—at home, at work, and in education, science, engineering, and medicine. The appendix traces the history of computing from the first century BC to the late 1990s. The book is written in an easy-to-read and jargon-free style. We have used a lot of images, tables, bulleted lists, etc. to make the reading and comprehension easier, and also to illustrate, familiarize, and demonstrate the capabilities, benefits, and limitations of IT and the related applications. The book contains a lot of pedagogical features. These include more than 1200 review questions (short answer questions, descriptive type questions, and essay questions) and about 1300 objective type questions (fill in the blanks, true or false, and multiple choice questions). The answers to the objective questions are given at the end of each chapter. The questions are designed to make your learning easy and effective.